Each August as the Earth's annual orbit takes it through the remains of the comet Swift-Tuttle/109P, we are treated to a dramatic show of meteors streaking through the sky called the Perseids. Named because they seem to radiate from the constellation Perseus, this meteor shower will peak tonight Wednesday August 12th. 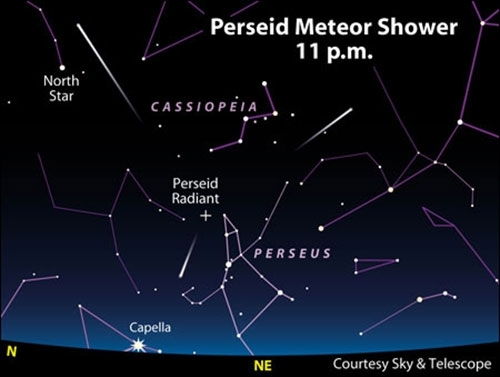 It is not uncommon to see up to 100 meteors an hour with the Perseids. Each night for the rest of the week is forecast to have mostly clear skies in the Philadelphia area and the summer temperatures will make viewing late at night very comfortable. The moon is close to a new phase and should not interfere. The best times to look are after midnight until close to dawn. The height of the shower should be Wednesday night the 12th into Thursday morning. The show will begin between 11 p.m. and midnight on Wednesday night and continue until dawn Thursday the 13th. The constellation Perseus will rise in the northeast skies so focusing your attention there is a good place to start, but meteors can fly across any point in the sky. The best place to watch in Philadelphia is anywhere in an open field with clear views of the sky. And of course, as far away from the city lights as you can get the better. You will want to get comfortable and allow your eyes to adjust to the dark. Bring a blanket so you can lie down and look up without straining your neck. As you watch, you may want to listen to iradiophilly's Symphony for Classical and Contemporary Favorites! But enjoy any of our 24 stations as your soundtrack.